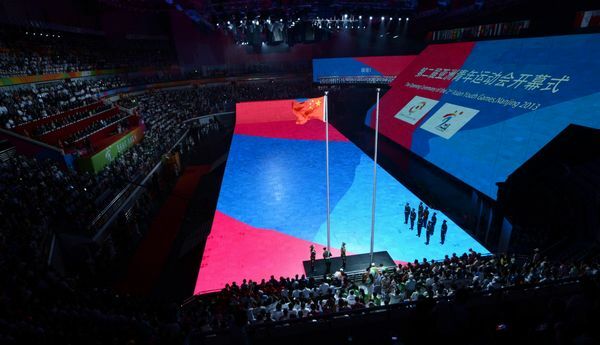 The future of Asian sports - over 2,400 athletes aged between 14 and 17 years - take the spotlight beginning Friday as the 2nd Asian Youth Games raised its curtain in Nanjing with an opening ceremony reminiscent of a video game. Chinese vice premier Liu Yandong declared open the nine-day games themed 'Celebrating Youth, Passionate Asia', which will bring the athletes to 27 venues across the city by the Yangtse River to participate in 16 sports - diving, swimming, athletics, badminton, basketball, fencing, football, golf, handball, judo, rugby union, shooting, squash, table tennis, taikwando, tennis and weightlifting. "This is not just a games for sports, but a games for spreading knowledge among young people," said Liu Yi'an, vice president and secretary general of the organizing committee, before the games. The 40-minuite show, built with volunteers to a very frugal budget, was a mixture of a stage show and a party designed by teenagers with the help of directors, most of them under the age of 30. London Olympic women's team epee fencing champion Xu Anqi paired with Qiu Liyong, aged 16, a runner-up at the 2011 national middle school student basketball championship.